This interview took place in January, 2008. 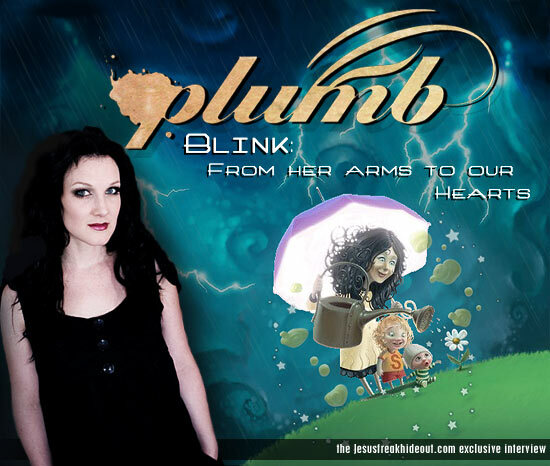 Tiffany Lee: "Blink" is the track off the album that I felt encompassed the whole project, much like "In My Arms" does as well, but a cooler word. The record is indeed a Plumb record minus the rock side of my art, as each project I make is hopefully a reflection of where I am at that time. Currently, I'm knee deep in being a new mother so the songs are inspired by my son, the one that was inside me during the entire time of its making, and how that parallels my deeper understanding of God's love for all of His children. However, I don't want to pigeon-hole Blink as a lullaby CD because it's beautiful and honest art that is inspired by what is moving me the most these days, which is innocence, grace, and forgiveness. The album is chill and relaxing; pure and poised, but somehow so unique it's edgy. JFH: When did you know for sure you wanted to record a lullaby album as Plumb? Were you concerned at all that some of your fans would trouble getting into such a project if it was mostly melodic and inspired by motherhood? Tiffany: My friend gave me the idea long before I was a mother, but it turned out way cooler than a lullaby CD. The record revealed a softer and more vulnerable side of me. True fans appreciate the artist they respect for being real, so there's no fear there for me because I have the most loyal fans. JFH: What inspirations musically did you draw from for Blink? Tiffany: Imogen Heap, Sarah MC, Bjork, Dido and, oh yeah, myself. JFH: Did you try out any of the lullaby recordings with your children before (and/or after) finishing the album? Tiffany: Several were songs I had been singing to Solomon already, which is why I recorded them. I tried others, but always went back to the two or three I was used to singing. I do play the whole album in the car a lot though. JFH: Can you tell us about the album's cover art? Tiffany: Sure. An illustrator named Fernando Juarez from Spain created it. The cover art is such an amazing depiction of what the whole album means. First and foremost, the word 'safe' is relative. We may or may not know the evil or chaos going on around us, but ultimately, if we belong to the Father, we are safe. JFH: Can you tell us the story about the song "Sleep" and why you recorded it again after it was featured on your previous record Chaotic Resolve? Tiffany: I wrote and recorded "Sleep" on Chaotic Resolve when I was pregnant with my first son and it just seemed fitting, after I had painted the words to the chorus on his nursery wall, that I do a new version for him as opposed to leaving the song where it was: Inspired by my pregnancy, not a person; since I didn't actually know him yet. Now that I do know him, it's ironic how the first verse is about being pregnant and how I was elated after he was born. It wasn't planned that way but turned out to just finish telling the story, so I now it's for him and not just pregnant mommas out there feeling fat. JFH: Do you have a favorite track on Blink? Tiffany: That's like asking which child is my favorite, but yes, there is one song I'm partial to. It's called, "Me," and it tells of the sacrifice of motherhood: The parts you hear about, but don't fully understand until you experience firsthand and how those sacrifices, no matter how great, pale in comparison to the privilege of being the mother to these beautiful boys. It's the major tearjerker on the record, but then again, I hear there are a few. JFH: Are you already thinking about or even working on a pop album follow-up to Chaotic Resolve? Tiffany: To be honest, no one has asked me that. Funny, the answer is "no." I don't know what the next album will hold… whether it will be another rock record or if I will stay in this mellow vein for a while. I honestly have no idea, so I'm just enjoying the release of Blink and not worrying about any deadlines right now. JFH: Is there a producer or artist you would really love to work with on an upcoming release? Tiffany: Matt Bronleewe and Jeremy Bose are really the only producers I plan to ever work with. Jeremy has done almost all the programming on all my records with Matt being the main guru. Now with Jeremy producing Blink, I look forward to them continuing to be the team that has helped not only establish my art but maintain it as well… I am loyal to them. As for an artist, I think it would be fun to do a duet with Michael Buble. Tiffany: PATIENCE. We have had our home and five acres for sale since April 1 of 2007. Neither has sold and our new home was just started. We'll be in a little predicament if it's not sold by Summer 08, but we're trusting God and doing all we know to do… believing that if we worry, it's wasted energy.